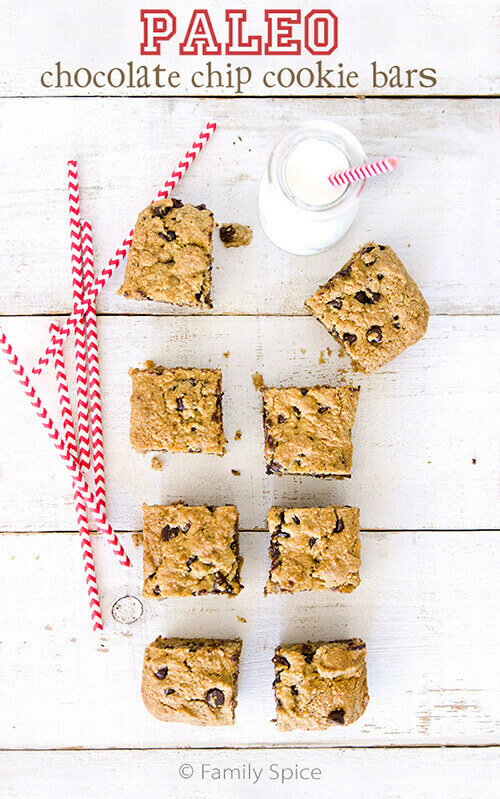 For a filling snack made of fiber packed almond meal, these Paleo Chocolate Chip Cookie Bars will please kids of all ages. Sponsored by Davidson’s Safest Choice® Pasteurized Eggs. Just when you think that you’ve seen and heard it all, there’s another diet craze that sweeps the world. The Paleo Diet has gained tremendous momentum, encouraging people to eat basically eat whatever we ate during the caveman years. This includes meat, eggs, fruits, vegetables and nuts. No rice, grains or processed foods. Dairy is a gray area. When your parents are a geologist and micro-paleontologist, you can’t help but snicker when you hear the term “paleo” and its place in the culinary world. My dad gives me a real sarcastic, scientific comments like, “You know, man was not around during the paleolithic period. You know, there wasn’t any chocolate during the caveman years.” Yeah, yeah, Dad. I do not follow a strict paleo diet. First of all, I like cheese. But I do like to eat a diet that is unprocessed. But again, I am not strict. I have kids and I am not about to spend my days making crackers and pretzels by hand. Whatever diet you follow, the more restrictive it is, the harder it is to follow the plan. I personally believe in moderation. There’a a place for dessert. And for some, there’s a big place in your life for dessert! These Paleo Chocolate Chip Cookie Bars are made with finely ground almond meal, eggs, olive oil and maple syrup. When using chocolate in the paleo diet, use high quality dark chocolate chips that have 70% cocoa or more. They tend to have minimal sugar and can be eaten on the plan as an occasional treat. Did you know that a piece of high-quality dark chocolate has less sugar than some fruits? Unsweetened cocoa powder is also paleo approved – again, no sugar added. 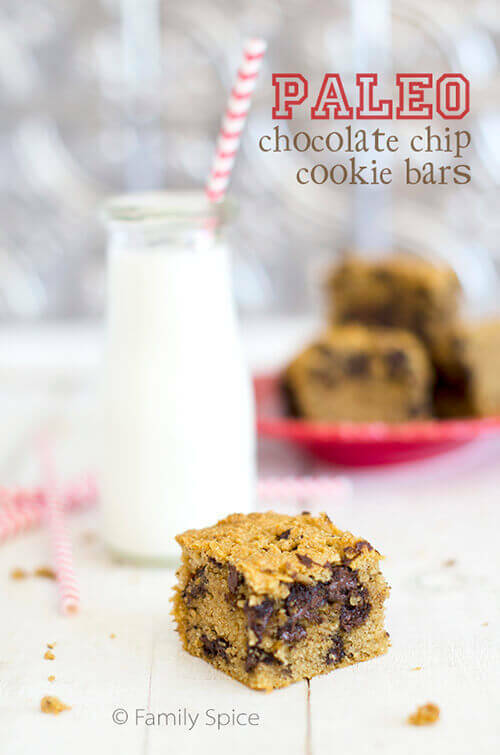 These Paleo Chocolate Chip Cookie Bars use minimal sugar. Although the recipe calls for 1/3 cup of maple syrup, I did bake it with 1/4 cup of maple syrup for even less sugar. You can decide which you prefer. I created this recipe for Davidson’s Safest Choice® Pasteurized Eggs. As you know, I love this product! 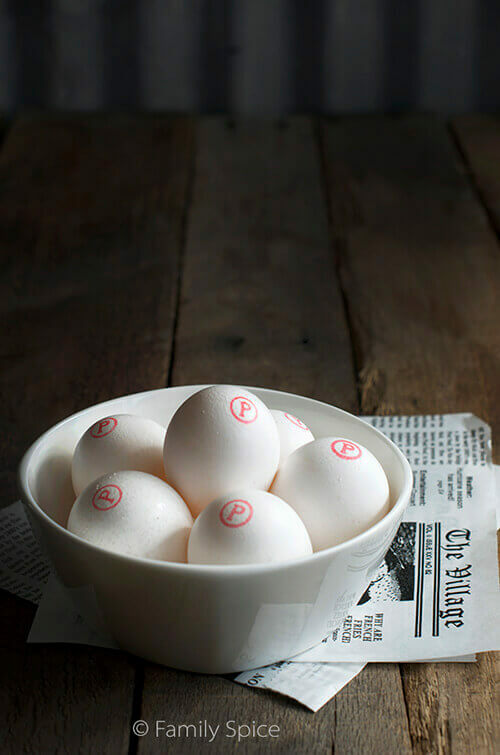 Their patented natural, award-winning egg pasteurization eliminates the risk of salmonella in eggs. When you have kids nibbling on raw cookie dough or licking spoonfuls of cake batter, using these pasteurized eggs gives you peace of mind and the guarantee that no one will get sick. For a filling snack made of almond meal, these Paleo Chocolate Chip Cookie Bars will please kids of all ages. Preheat oven to 350ºF and coat 9-inch loaf pan with non-stick spray and line bottom with parchment paper. Scrape cookie batter evenly into prepared pan. Bake until toothpick inserted into center of cookie bars comes out clean, about 25-30 minutes. Allow bars to cool completely, about 1 hour, before cutting into squares. 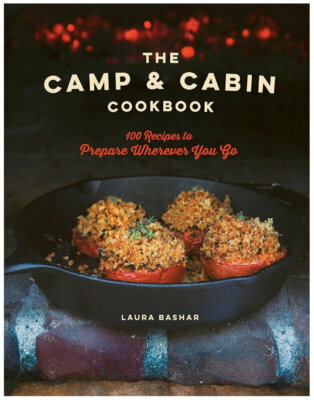 Haha – You crack me up, Laura: “I have kids and am not about to spend my days making crackers and pretzels by hand.” And I totally agree with your common-sense thinking about diets, moderation (and cheese!). That said, these look amazing! Can’t wait to make some for my kiddos! Paleo = healthy when it comes to cookies. Love this and pinning to try! I love baking with almond meal! This looks delish! These sound so yummy! I can’t wait to try making these!